Slightly overgrown climbs behind the sewage ponds.The lowest (first) climbs are those on the Poo Pond Slabs.There are 2 (or 3) climbs (one protected by an old piton) on the lower wall. The R and L being bolt protected. Cross Black Birch stream opposite the oxidation ponds and follow tracks up the scree. 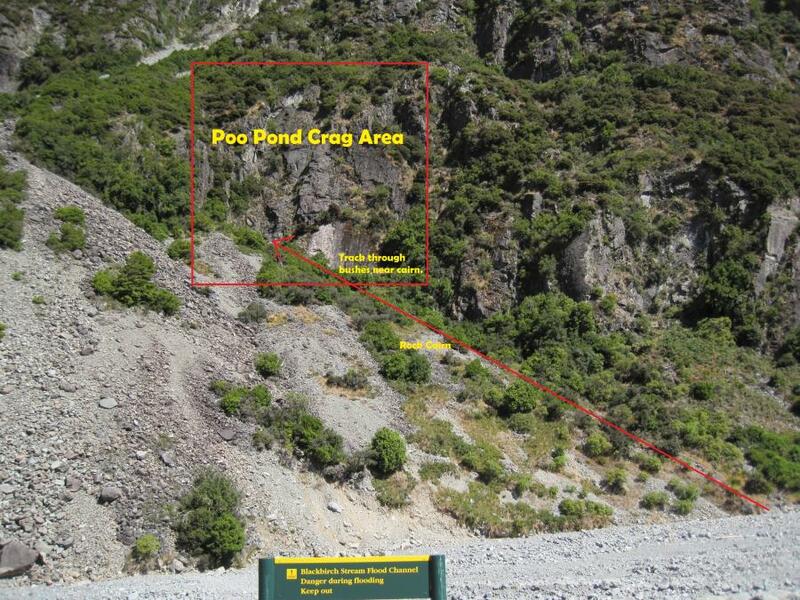 The first obvious area behind some trees is the Poo Pond Slabs. Climb the narrow rib in the trees moving R at 2/3 height. Chain Anchor. Short climb left of the Poo Pond slab over a small bulge - better than it looks. Probably the best way to climb the Poo Pond slabs now is to do this pitch (on the left of the wall over an over lap) and the original Poo Pond Slab Pitch 2 directly above it. Left most line on the slab. Step left at the 2nd bolt before stepping up over the overlap. The original route started on the R of the face to the ledge then a 2nd pitch above. Two pitches that probably deserve more traffic than they get. A line of bolts (mossy?) on the R of the wall to the ledge. Interesting climbing.The first bolts are remarkably close together then the gap and the clips get further apart.